Chicken wings are such a quick and easy snack to prepare, adjust your dip as required – I like some blue cheese or chilli sauce. Put the honey, tamari sauce, diced chilli, grated ginger, lemons zest and juice, the five spice and sunflower oil into a bowl and mix together. Add in the chicken wings and toss to combine until they are completely coated in the sticky glaze. Arrange the chicken wings and the marinade on a roasting tray. 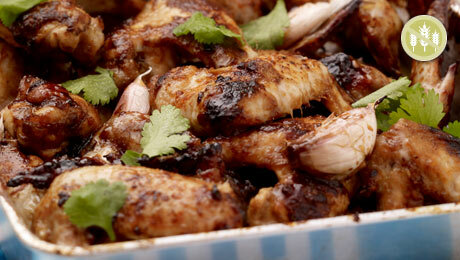 Bake for 30-35 minutes until the wings are fully cooked through and caramelised. In the meantime, prepare the dip. In a small bowl, mix the crème fraîche with the zest and juice of the third lemon, then add the spring onion and stir to combine. Place into the refrigerator until required. Check the wings in the oven every so often and give them a little shake to prevent them from sticking to the base of the tray, but also to ensure that each of the wings is covered with the sticky glaze. Serve hot or cold with the crème fraîche dip.